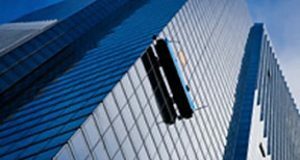 When it comes to professional commercial window cleaning in and around New York City, Total Window Service has many options to offer. We work with different types of equipment, including heavy machinery like bucket trucks and boom lifts, in order to access surfaces located in any area of our clients’ buildings. No matter how high your building is, we will come up with the right solution to perform a safe and top-quality job! We are certified by IRATA & SPRAT World and US Rope Access Associations. Rope access typically allows us to clean up to 80 percent of any building’s outer surfaces on all sides. This approach is much less expensive compared to bucket trucks or boom lifts, and it allows us to offer really competitive prices to our customers. For buildings with a permanently suspended scaffold (Davit System), we offer our professional window cleaning team. All our window cleaning supervisors are well-trained in using scaffolds, and they are required to pass a 32-hour suspended scaffold supervisor training class. Sometimes, accessing windows can become a challenge. 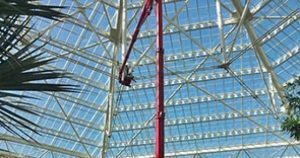 When rope access and other means are not possible, we offer our customers effective bucket truck or boom lift services for window washing and glass restorations. This approach is more expensive, but you can always be sure that we will reach each and every corner to achieve the desired results safely and effectively.